I Know What Colby Jack Is! – He Said What?! I Know What Colby Jack Is! I thought I would share some highlights (or not!) of Aaron’s week. It’s been full of ups and downs, as usual. Our life with Aaron is always a yo-yo type existence. We may be laughing one minute, and not long afterward we may want to cry. That’s where I’ve been this week. Thursday was my day of tears…..tears of frustration and worry for Aaron as he bears the repercussions of his behaviors. Aaron had a rough time at his day group on Wednesday, so he wanted to stay home on Thursday. I let him, all the while wondering if I was right in doing so. I wish I could say I have all the answers, but Aaron constantly shows me that I do not. I’ve been with Aaron, even recently, when he walks into Paradigm, his day group. As soon as he walks in the door, he puffs up and usually launches out toward someone. It may be to say hello and then try to say something funny while he bends over and rubs his hands together in glee….or it may be to give someone a resounding whack on their arm or back or rear…..or it may be to step on someone’s foot……or it may be to say something that he thinks is funny, but which is not funny at all. Clients and staff have the same reaction that Gary and I have at home, either laughing or cringing or having to correct. After his rough day on Wednesday, and his stay-at-home day on Thursday, I was wondering how Friday was going. When he burst in our door at the end of his day, he was happy and smiling. We talked awhile before I asked him how his day had gone. He told me he had a good day. He went to a movie with the group, and Stephanie and Shauna asked him to sit between them. We talked about his popcorn….extra large, of course…..and I asked him if he had gotten a refill. See? There he goes, being offensive…..and he just doesn’t get it, or can’t control his words, or doesn’t care. Who can know from one moment to the next? I scold and correct, but he is still sure in his mind that he doesn’t want to get fat like _____, and Mom asked if he got a refill so he had to tell her why he didn’t, and I feel that my words are useless. Sometimes his words are actually humorous because of their bluntness as he says things that others would never say, at least out loud, but we can’t let him see us laugh. Personal insults are never humorous, though, as we tell him repeatedly. “Well, that’s good,” I answered with a hint of caution that he didn’t notice. “How did you make Shauna laugh?” I asked with a little dread. “By making farting noises! !” he proudly answered, bending over then while he rubbed his hands together in delight. How does he have skin left on his hands anyway? You see why I ask with dread. Do I act proud that he made Shauna laugh, even though it was because he made farting noises? Or do I frown and try to correct his continual use of farting noises for affect? I chose to try to correct, with a smile, but he was already off and running with his next subject. We had our first spring thunderstorm on Monday night. Aaron loves thunderstorms and rain. I didn’t even realize we were about to get a storm as he got ready for bed and told me goodnight. His bed was just right. We had gotten all the bumps out of the covers. Well, I had, as he stood there staring at the one large bump that he wanted smoothed out before he would progress any further with his bedtime routine. Mr. Snake and Mr. Skunk were in his bed just right, too, so I was able to hug Aaron goodnight and escape to our bedroom…..where Gary and I lock our door on most nights for our well-being and peace. It wasn’t long before I heard the first rumble of thunder, soon followed by another rumble. Thump, thump, thump! That was Aaron walking with great purpose up the hall. Knock, knock, knock on our bedroom door….after he had tried to first open it without knocking. Thus the lock. “Was that thunder?” he asked. Thump, thump, thump back to his room. Soon…..thump, thump, thump back to our room. Tried to open door. Knock, knock, knock. “Is it going to rain?” he wanted to know. Thump, thump, thump once again to his room. But not for long. Thump, thump, thump to our door once more. Tried to open door. Knock, knock, knock. “Is it raining yet?” he asked. I don’t know!! WHY DON’T YOU LAY DOWN AND LISTEN?? Thump, thump, thump down the hall again…..for the last time, thankfully. He did lay down in his bed and listen to the storm, and to the little bit of rain that we got. It’s a process for Aaron, though. You see, I’ve often tried to delay the eating of such offered treats, but Aaron follows me and watches me until the morsel is in my mouth, chewed, and down the tubes. No fooling Aaron on that one. My immune system is awesome, probably due to all the germs I ingest with each Aaron food gift. I thanked him for the cheese cube as I held it with suspicion, hopefully suspicion that was hidden from him. He then demonstrated how you can bite the small cheese cube in two. “You can bite the half off! !” he declared with delight. I laughed as he laughed. Only Aaron would take a boring cheese cube and make it funny. He never did show me the second way to eat a cheese cube because he followed me while I went upstairs, still holding my cheese cube, as he watched like a hawk to see when I would eat it…..either whole or by biting the half off. So then I was laughing at my silly little cheese cube as we discussed its true make-up, and I promised Aaron that I would eat it….which I did. No side effects yet. Little things become so huge to Aaron. 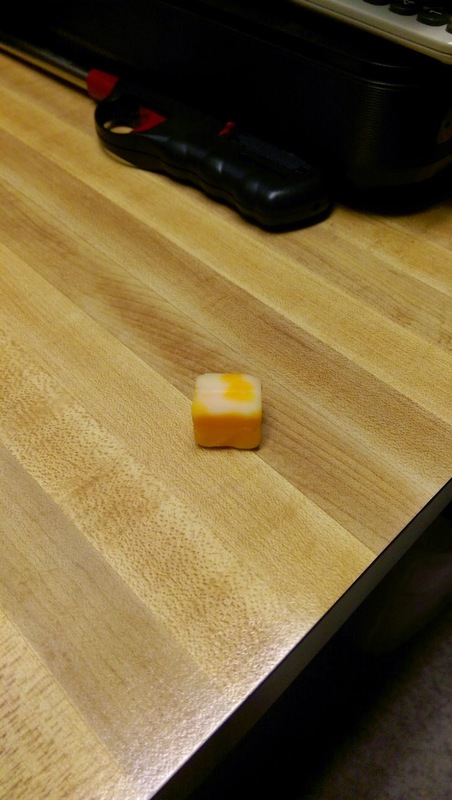 A storm….a cheese cube. Through his observations I find myself drawn into the complexities of even the most mundane things. And yet Aaron so often cannot see the complexities of things that truly affect his life…..things like his comments and his behaviors that can be so annoying and insulting. He would much rather talk about a storm or a cheese cube than talk about his hurtful words or his hitting. This is the hidden element of his disability that so impacts his life, but he doesn’t get it. It’s very hard to always remember this about Aaron, and to react with understanding and instruction. That little cheese cube reminds me so much of Aaron. He thinks it’s Cheddar and Swiss, and we’re reminding him that it’s Colby and Monterey Jack. He thinks it’s all right to do this or say that, and many of us are reminding him that it is not all right to do those things. Life is not meant to be lived the way that Aaron often perceives it, so we keep hammering away and hoping that someday…..or at least on most occasions…..Aaron will remember what should truly comprise his interactions with others. It’s not farting noises, either, by the way.